Visit sftravel.com to plan your next visit to San Francisco. It's Memorial Day weekend when my brother and I decide on a whim to take a short trip to San Francisco. I went to the Fog City three years ago for the Outside Lands music festival. The festival was in Golden Gate park, so I spent my visit then in Ashbury Heights and the Mission District. This time around, I get to hang out in Union Square and the Central Waterfront. ONE SLICE AT A TIME After trekking the hilly sidewalks of the Golden City, stuffing our faces with the biggest slices of pizza is a necessity. We get a hotel room in Union Square and walk around that part of the city, checking out the name brand stores that line the streets. We, of course, had to take the trolley—like true tourists—to Fisherman's Wharf. I like it because it's a simple way to enjoy the views of a city that you would otherwise miss. The wharf is a whole other ball game; there are so many people walking around, taking pictures, eating snacks, and checking out the shops. There are two restaurants from my trip that I have to recommend—Sweet Maple and Tony's Coal Fired Pizza and Slice House. Sweet Maple is in Lower Pacific Heights. The restaurant is known for their million-dollar bacon, bacon that is slow cooked for hours with brown sugar and spicy peppers. I'm sorry I don't have pictures to share, I am too hungry and too busy gobbling down every last bit of bacon, scrambled eggs, potatoes, and toast. 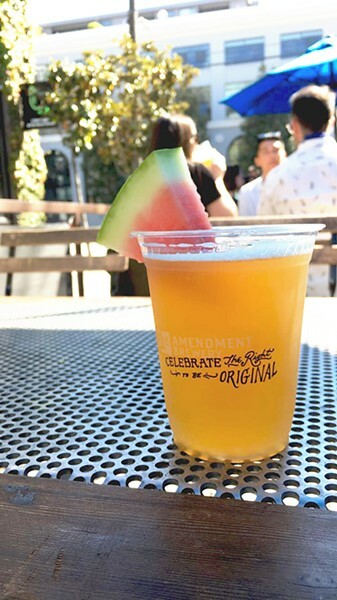 CHEERS TO A COLD ONE 21st Amendment Brewery's newest sour ale, Watermelon Funk, is tastefully served with a slice of watermelon on the rim of my cup. 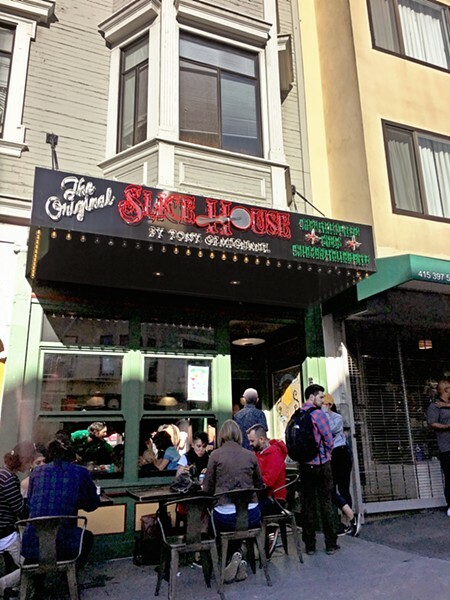 Tony's Coal Fired Pizza and Slice House are a restaurant and slice house side by side in the Telegraph Hill neighborhood. My brother and I decide to grab a couple slices of pizza and not wait around for a table. We stick with our instincts and go for the original pepperoni. I love pizza, but this is a masterpiece with the perfect cheese-to-thin-crust ratio. Did I mention the slices are as big as my face? I'm a petite-sized woman, so imagine that! Our last memorable stop is 21st Amendment Brewery in the South Beach area, conveniently located near AT&T Park. I wouldn't really have a love for craft beer if it weren't for my brother, so my taste buds thank him. We have to make a stop at the brewery and restaurant, and while we don't get anything to grub on, we do enjoy a couple beers in their patio area. We order their newest sour ale, Watermelon Funk. Not to confuse it with their seasonal Hell or High Watermelon wheat beer, which is also very tasty. Watermelon Funk is the perfect sour ale for your summer barbecue, picnics, and camping trips. Yeah, I'm thinking a lot about this sour beer. Staff Writer Karen Garcia left her heart in San Francisco, but she was born in LA. Contact her at kgarcia@newtimesslo.com.